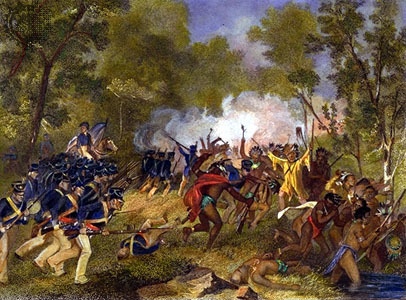 The Battle of Tippecanoe was fought on November 7, 1811, between United States forces led by Governor William Henry Harrison of the Indiana Territory and forces of Tecumseh's growing American Indian confederation led by his brother, Tenskwatawa. In response to rising tensions with the tribes and threats of war, an American force of militia and regulars set out to launch a preemptive strike on the headquarters of the confederacy. 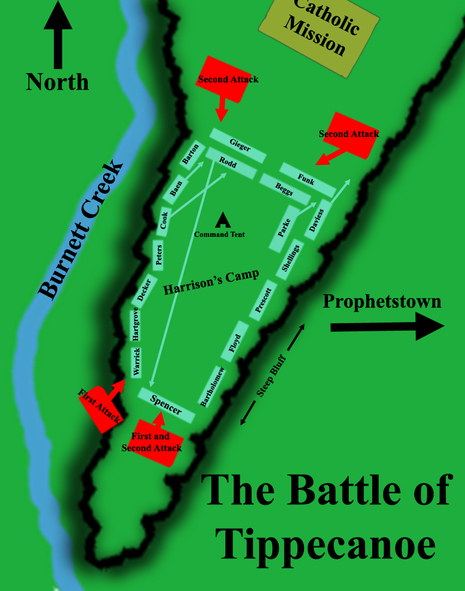 The battle took place outside Prophetstown, at the confluence of the Tippecanoe and Wabash Rivers. Although the Americans were victorious both tactically (as they held their ground and Prophetstown was destroyed the next morning) and strategically (Tecumseh's confederacy never recovered), the win was costly as the tribes attacked with fewer men and sustained fewer casualties. The battle was the culmination of rising tensions in a period sometimes called Tecumseh's War, which continued until Tecumseh's death in 1813. In addition to serving as an important political and symbolic victory for the American forces, Tippecanoe dealt a devastating blow to Tecumseh's confederacy, which never regained its former strength. Public opinion in the United States blamed the Native American uprising on British interference and helped catalyze the War of 1812, which broke out only six months later.